Ben Skowronek receives a pass. The sophomore finished with eight catches against Nevada. 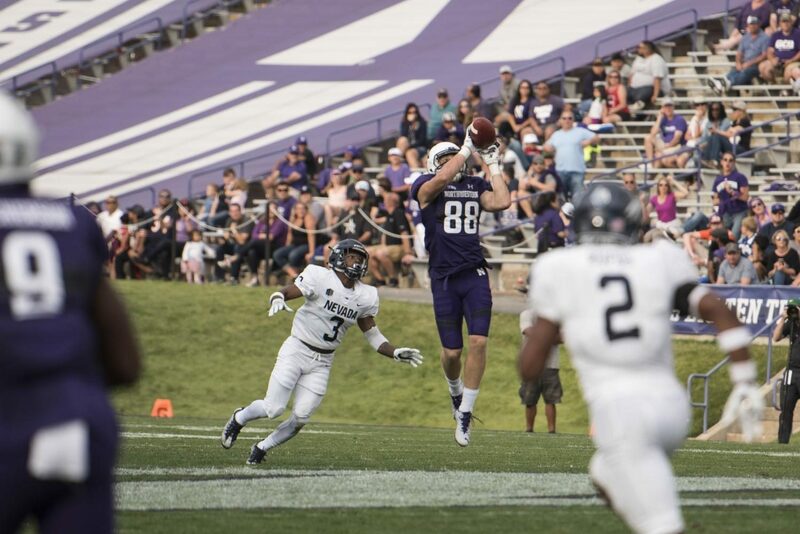 Northwestern may have lost star wideout Austin Carr following last season, but junior quarterback Clayton Thorson found success targeting an array of pass-catchers in Saturday’s season-opening win against Nevada. Thorson tossed for 352 yards, matching his career high, as the Wildcats (1-0) pulled out a 31-20 win and made significant progress in dispelling the question of how NU’s receiving corps will replace the graduated Biletnikoff Award finalist. Sophomore Ben Skowronek led the way for the Cats, pulling down eight catches for 123 yards, including a tough jump-ball catch for a 48-yard gain that came off a Thorson scramble. Though Skowronek fumbled once, the productive outing doubled his career reception total. He also credited the rapport he has built up with Thorson. The quarterback, for his part, also connected with a handful of veteran targets: Senior superback Garrett Dickerson and junior wide receiver Flynn Nagel each caught four passes for 29 yards, and senior wide receiver Macan Wilson nabbed three catches, including a 33-yard touchdown and a 41-yard, fourth-quarter grab. And out of the backfield, senior running back Justin Jackson hauled in five catches for 42 yards in addition to his 109-yard rushing day against the Wolf Pack (0-1). Thorson completed passes to eight different teammates. Six had multiple receptions, including redshirt freshman Riley Lees, who made his first career catch and found the end zone in the third quarter. The diverse air attack proved too much for a Nevada team that led for much of the game at a sleepy Ryan Field. Though the Wolf Pack held a 17-7 halftime advantage and led into the later stages of the fourth quarter, NU found enough offensive answers to roll up 508 total yards and eventually put the visitors away. Though Jackson cleared 100 rushing yards, he averaged under four per carry, and holes in front of him often clogged up. That left it to Thorson and his receivers to ultimately seal NU’s win and show they can get it done without Carr and the 90 catches and 1,247 receiving yards he put up a year ago. Against Nevada, they performed like it, making enough plays to push the Cats to victory.